This book fills a major gap in the ever-increasing secondary literature on Hannah Arendt's political thought by providing a dedicated and coherent treatment of the many, various and interesting things which Arendt had to say about law. Often obscured by more pressing or more controversial aspects of her work, Arendt nonetheless had interesting insights into Greek and Roman concepts of law, human rights, constitutional design, legislation, sovereignty, international tribunals, judicial review and much more. 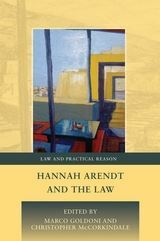 This book retrieves these aspects of her legal philosophy for the attention of both Arendt scholars and lawyers alike. The book brings together lawyers as well as Arendt scholars drawn from a range of disciplines (philosophy, political science, international relations), who have engaged in an internal debate the dynamism of which is captured in print. 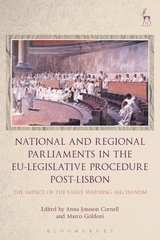 Following the editors' introduction, the book is split into four Parts: Part I explores the concept of law in Arendt's thought; Part II explores legal aspects of Arendt's constitutional thought: first locating Arendt in the wider tradition of republican constitutionalism, before turning attention to the role of courts and the role of parliament in her constitutional design. In Part III Arendt's thought on international law is explored from a variety of perspectives, covering international institutions and international criminal law, as well as the theoretical foundations of international law. Part IV debates the foundations, content and meaning of Arendt's famous and influential claim that the 'right to have rights' is the one true human right. “...the more striking and radical achievement of Hannah Arendt and the Law is its success as a representational text that gathers together Arendt's insights about law for close reading and which, in carrying out this task, reverses her question about the role of law in politics. ...the more remarkable and unintended effect of the essays is to welcome Arendt into the fold of legal studies and not the reverse accomplishment that would have been to admit disciplinary differences while accepting that she sometimes relates to law by commenting on it. That is, these texts innovate not simply by extending the secondary literature about Arendt but by using Arendt in order to reorientate and extend legal theory, particularly where such theory looks to understand the political consequences of law. Marco Goldoni is a Senior Lecturer at the Law School, University of Glasgow. Christopher McCorkindale is a lecturer in law at the Glasgow School for Business and Society at Glasgow Caledonian University.